Everyone that we know hates the banks. Everyone is sick of hearing the stories of the major banks posting billion dollar profits and CEO's receiving multi-million dollar salaries, while most people struggle to make ends meet. The average person is, quite simply a slave to the banks. We have become enslaved through debt and, whilst most people falsely believe that they're free, the reality is that no-one is more enslaved than the man (or woman) that believes that he (or she) is free. Below is a very brief overview of the ultimate fraud committed by the banks. We recommend that, if you are interested in finding out more, you read the Banking chapter in our e-book or go to the Bank Secrets Revealed website – www.banksecretsrevealed.com.au - and grab a copy of their extremely comprehensive book, which details all the deep, dark secrets that the banks have been trying to hide from us for decades. To really understand the fraud, you first need to understand what “money” is. Money, as we know it, comes in the form of coloured polymer notes issued by the Reserve Bank – which, by the way, is privately owned by the international banking cartel – and they tell us that it is legal tender. Unfortunately, however, it is completely worthless, and the ONLY thing that gives it purported “value” is that people are prepared to accept it for its face “value”. Now, these polymer notes were originally paper notes and those, in turn, used to be certificates for gold. In the old days, when we used to have a gold backed currency, you could always exchange your “notes” for the amount of gold detailed on them. This is an important point that you will need to get your head around if you want to fully understand the ultimate banking fraud that is explained below. When you buy a house, you run around looking for properties until you find just the right one. You then negotiate with the real estate agent or vendor and settle on a price - you do all that work, not the bank. You then approach the bank and ask to borrow x amount of dollars. For simplicity, in this example, we'll say it's a million dollars. Now, the bank doesn't obviously just hand over a million dollars and say "Here you go, go buy your house, just pay it back when you can" - in fact, far from it. Instead, what they do is they defraud you with 3 important documents - the loan agreement, the mortgage document and the Certificate of Title. Now remember, the loan agreement is a promise to pay back that $2 million+ over, say, 25 years - it is a promissory note. The bank can on-sell your promissory note by way of securitisation, which is what happens the majority of the time. That starts to get very complicated so we won't get into that, but the point to take from this is that the loan agreement is the value to the bank. Now, the mortgage is the guarantee that the bank can take some kind of action if you break your promise to pay. In this case, they have a mortgage over your house and have a right to sell it to cover any shortfall. It is very important to note that YOU own the house at all times. It is not a case that the bank owns the home until you pay it off - you can paint it, renovate it and even sell it if you want to - the bank will expect that their balance is paid off before the property changes hands and no buyer would purchase a house that still had a mortgage in place but they certainly could, by law, if they wanted to. This is VERY important to understand though, it's YOUR house NOT the bank’s! Okay, so now we get to the juicy bit - the Certificate of Title. What is it? It is the title to your house. Remember we said previously that bank notes used to be certificates of title to an amount of gold? Well, in this case, the house is the gold because it has value, so the Certificate of Title is the “money”. Remember, at ALL times, the Certificate of Title has YOUR name on it, it's yours. So, what happens to it at settlement? The bank keeps it - why? Why do they keep YOUR Certificate of Title when they already have the value from you - your loan agreement - and they already have the mortgage document, which is their security. They have it because they steal or swindle it from you. We challenge you all to look through your mountain of terms and conditions and see if the Certificate of Title is listed or detailed anywhere. They don't mention it and, because it is not mentioned and they take it, then they have defrauded you. There has been no meeting of the minds - a necessary part of any lawful contract - because you have not been given full disclosure before you entered into the contract. So, what do they do with it? Well, as the guys at Bank Secrets Revealed explain, the banks deposit that on their books as an asset, and that is where the “money comes from that they then supposedly "loan" you. So, in essence, they have stolen the money from you that they then turn around and loan to you, at interest. They then turn around and bundle up your loan agreement with many others and securitise - or sell them off, so they have already been paid once. They still collect monthly payments from you for the life of the loan so, you have paid 2 - 3 times the amount of the supposed "loan" and, if you miss even a few payments, they can then turn around and sell your house and get paid a THIRD time. Now, if that's not fraud, then we don't know what is! What Rights do I Have Against the Bank? So, now that you understand this - even if you only have a basic grasp of what we have just explained, the fraud should still be clear - what can you do about it? Well, anyone who has a current mortgage can write a powerful letter to their bank asking about the Certificate of Title. The guys at Bank Secrets Revealed have created a series of letters that you can send to your bank, asking essential questions about your Certificate of Title and how they are using it. These letters use all the correct legal and banking jargon that puts the banks On Notice, that you know what you're talking about. There are also other letters that you can send in relation to personal loans or credit cards and other letters still that can be sent to debt collectors, if things have progressed further. Were you forced to pay mortgage insurance when you took out your home loan? Do you understand that the mortgage insurance policy that the bank forced you to pay for actually only covers them, and not you? Would you like to do something about this clear and obvious insurance fraud? Great! There is another specific, pre-written letter for that too, in the Bank Secrets Revealed e-book, that you can simply print off and send to your bank to get the ball rolling. "The Truth About Banks and How to Beat Them!" Proof that the banks 'create money' through loans. Despite the detailed explanation outlined above, some people still question whether banks really do 'create money' through their fraudulent lending practices and they want further proof. We always encourage people to do their own, independent research into any topics or concepts that are of interest to them and, to assist with that task, we would urge you to read through this speech by the Chairman of the Governing Board of the Swiss National Bank, which is entitled "How money is created by the central bank and the banking system". 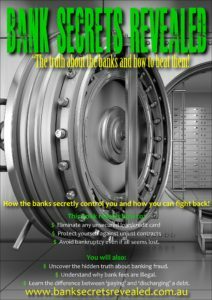 You can access a copy via the link at the bottom of the Bank Secrets Revealed home page. "In our present-day financial system, the creation of deposits by banks is closely linked to the granting of loans. When a bank provides a loan, it credits the amount in question to the borrower in the form of a deposit to his or her account. This leads to an increase in credits on the assets side and in customer deposits on the liabilities side of the bank’s balance sheet." "...the banking system can increase the volume of customer deposits by granting loans. The deposits created by the banking system belongs to the banks’ customers. It is the customers who can use it to procure goods or services, or to meet financial obligations, not the banks." There's some other really great information and admissions in that speech so be sure to have a read through it when you can.